This room has a king sized bed & single bed with shower en-suite. The room is situated on the 3rd floor with views of the Great Orme. The Family suite has 2 seperate rooms behind 1 secure door and a shower en-suite. 1 room has twin beds and the other room has a king sized bed. The family suite is situated on the 3rd floor with sea views. This room has a double bed with bath & shower en-suite. 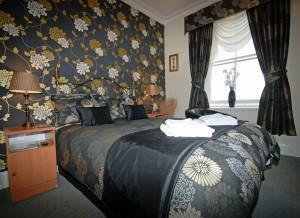 The room is situated on the 2nd floor with views of the Great Orme. This room is one of our most popular enjoying fantastic views accross the bay,and has just been refitted. This room has a kingsize bed with bath & shower en-suite. The room is situated on the 2nd floor with sea views. This room has a double bed with shower en-suite. The room is situated on the 2nd floor with sea views. This room has a double & single bed with a bath & shower en-suite. The room is situated on the 1st floor with rear view. This is our best and most popular room,enjoying possibly the best views in llandudno through the large bay window,it has just undergone a refit.The room has a superking sized bed with bath & shower en-suite. The room is situated on the 1st floor with sea views. This is a new luxury room fitted out to a high standard,with a kingsize bed and a single bed,and has had no expense spared.this room is especially suitable for elderly or people who are not so good with stairs.This is a large spacious room,but does not have a window or views,it has had an air con unit fitted.